The Danny's World two button folding walkers are simple, light-weight and adjustable. They fold for easy storage. 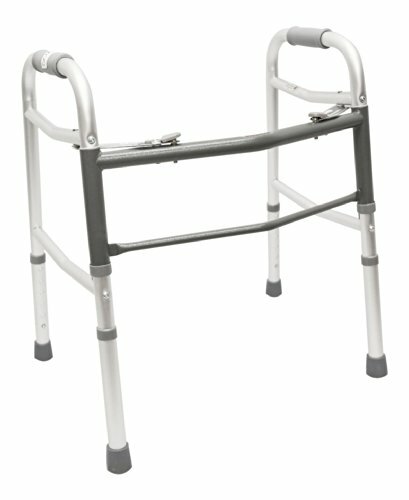 The adult walkers have eight numbered pegs for height adjustment from 30.5 inches to 37.5 inches tall. The child walker has six pegs for height adjustment from 25 inches to 30 inches tall. The adult walker comes with or without wheels. Walkers fold with two easy buttons on top! Comes with or without front wheels. Adult walkers adjust from 30.5 to 37.5 inches tall. Child walker adjusts from 25 to 30 inches tall. All adult walkers have eight numbered pegs.